Promote your page to your family and friends to help you reach your goal. You'll need to fill out an entry for each donor who writes a check so we can send them a receipt for their tax-deductible donation. 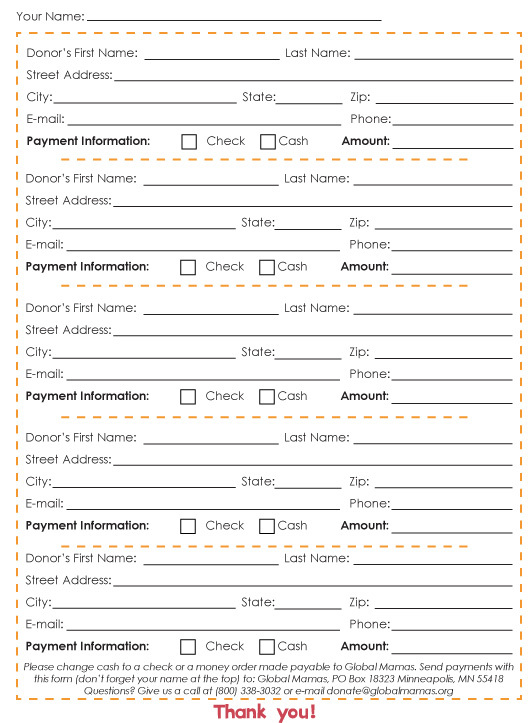 Do not give these to your donors as receipts, these forms are for Global Mamas' records! Donors will receive receipts from Global Mamas for their records after their donations have been processed. After receiving your money in the mail, we'll update your personal CauseVox fundraising page to increase the total amount you've raised by however much you've sent in. Give them the link to this donation form that they can print out or you can download it and print it out for them. 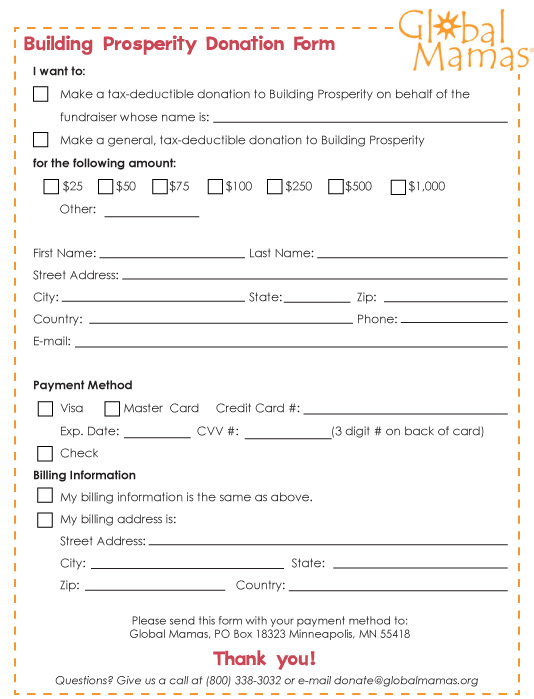 Be sure to ask them to include your name on the form so their donation is attributed to your fundraising campaign. After receiving their money in the mail, we'll update your personal CauseVox fundraising page to increase the total amount you've raised by however much they've sent in. The easiest way to multiply the donations that you collect is by reminding donors about company matching. Many companies are more than happy to match their employees’ tax-deductible donation to the non-profit of their choice, all they need to do is ask. Below are four easy steps you can give to your donors so they can double their impact. 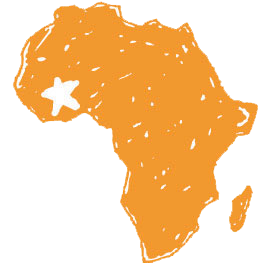 As long as the donation match is received by December 31st, it will count towards your fundraising campaign.